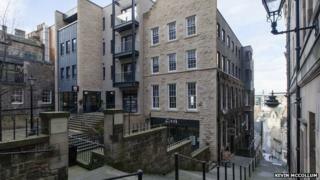 The restoration of a narrow backstreet in the heart of Edinburgh's Old Town has won the UK's richest architectural prize. Advocates Close was one of 13 projects shortlisted for the RIAS Andrew Doolan Best Building in Scotland Award. The development saw nine listed buildings transformed into commercial, office and residential spaces. Judges paid tribute to the "care and deliberation" with which contemporary and historic had been brought together. Morgan McDonnell Architecture, who designed the £45m project, received the prize of £25,000 and a gold medal at the awards ceremony in Edinburgh. The nine buildings in the development are thought to date as far back as the 15th century. They have been refurbished into commercial units, a restaurant, offices and a bar/bistro with serviced apartments. Judges said the development "brings new vibrancy to this precious but previously neglected area of the World Heritage Site." Their citation said: "It is the care and deliberation with which contemporary and historic have been brought together that is most deserving of praise. "The architects and their enlightened client sought to rehabilitate a collection of historic buildings, characteristic of a unique setting. They have brought new life into an area which had previously been passed by." RIAS president Iain Connelly said the award had never been an "architectural beauty contest". He added: "This year's winner combines careful restoration with bold and uncompromisingly contemporary new additions in an idiom which is sensitive to its setting while avowedly 'now'. The complexity of what has been delivered and the architectural self-assurance with which it is achieved makes this an extraordinary, truly special and very deserving winner." The judging panel was tasked with looking for projects which showed innovation and design excellence, irrespective of size or type. Other key considerations were detailing, accessibility, environmental issues and technical skill. The award was presented by Culture Secretary Fiona Hyslop, who said: "Advocate's Close exemplifies the highest standards of place-making providing a vibrant new quarter in the heart of Edinburgh's Old Town and is a worthy winner of this year's RIAS Andrew Doolan award." From the 83 entrants for the 2014 RIAS Awards, 13 were shortlisted for the award, which is named in honour of architect and entrepreneur Andrew Doolan who founded the awards in 2002 but died two years later. Four of the buildings on the shortlist were felt by the judges to have been worthy of a special mention: The Birks Cinema in Aberfeldy; House No. 7 on the Isle of Tiree; The Inn at John O'Groats and Scottish Water - The Bridge, in Stepps. This year's awards ceremony also paid tribute to Prof Andy MacMillan, the chairman of the judging panel, who died suddenly during the judging visits. Mr Connelly said: "Andy was a great architect, an educator of international renown and one of the finest human beings it has been my privilege to know. His influence on generations of students at the Mackintosh School of Architecture and in the many other institutions where he taught, was immense. "Andy will be remembered as someone who lived life to the full, who inspired all those he taught and all those who encountered him, as an individual of enormous talent, tremendous enthusiasm and irrepressible fun. "Andy's legacy is the hugely improved built environment of Scotland wrought by his own hand and those of successive generations of his students. He will forever be missed."